There is something winning about the game developer who can't hold back when he meets with Kotaku's man in New York. We're talking about a game developer who always dreamed of making a game like Super Metroid and is putting one out this summer. He's a developer so relaxed about showing his game that he's doing it barefoot and so pumped that he keeps showing off — this thing, oh and this thing, and this too — more and more cool stuff. Shadow Complex Preview: Where&apos;s The Morph Ball? It's a game that shows well, whether demoed with socks and shoes or without in Mustard's midtown Manhattan hotel room on a sunny summer day. Mustard said he always wanted to make a so-called Metroidvania game, the kind of side-scrolling exploration-heavy, empowerment adventure rendered by Nintendo and Konami back during the NES to PlayStation eras. Now he's got one close to completion, a spiritual successor to Super Metroid that runs on Unreal graphics technology. He describes it as a game of exploration punctuated by combat. It's a mostly side-scrolling game of military bases, robots, forests and caves, rich in earth tones and energized by explosions and energy blasts. , 120 power-ups — many of them hidden — and a bunch of core power upgrades. A flashlight reveals which boulders can be obliterated only once the hero has missiles, which hatches need a different gadget. A distant corner can only be grabbed once the player's earned a grappling hook. The game has a "Jason Bailey" Achievement for speed-runners who clear the adventure in two hours — 10 hours fewer than Chair's testers are clearing it their first time through. And, get this Metroid sequence-breakers, it's got an Achievement called Insurgent that rewards players who can figure out how to clear the game while only obtaining 4% of Shadow Complex's items. And the most Metoidvania thing of all... the map. It's drawn over grid squares. Seven-hundred eighty squares, not counting the skyline. Mustard's team of Metroid-lovers counted squares on the Super Metroid map. That total? Two-hundred fifty five. Mustard was showing Kotaku some exciting stuff. This included stuff his publicist (who is also his wife and was seated nearby) hadn't seen yet. He couldn't resist. He wanted to show the dark caverns of the game to demonstrate what real 3D lighting effects can do for the dark exploration of a Metroid-style game. He wanted to show battles with medium-sized mechs and screen-tall mechs who are far taller than the height of his hero's generous jumping height. He wanted to show the hidden power-ups he knows how to find, the secret crannies where an extra grenade-capacity icon is sitting. He showed that his game's got an ability for its hero to run, momentum-based at super-speed... dashing across water, up walls, on ceilings. His hero shoots a foam gun that generates cover, gums joints of enemy mechs or provides the materials that will make, on impact, a missile detonate in a bigger explosion. The gameplay is a throwback. The graphics are a throw forward. 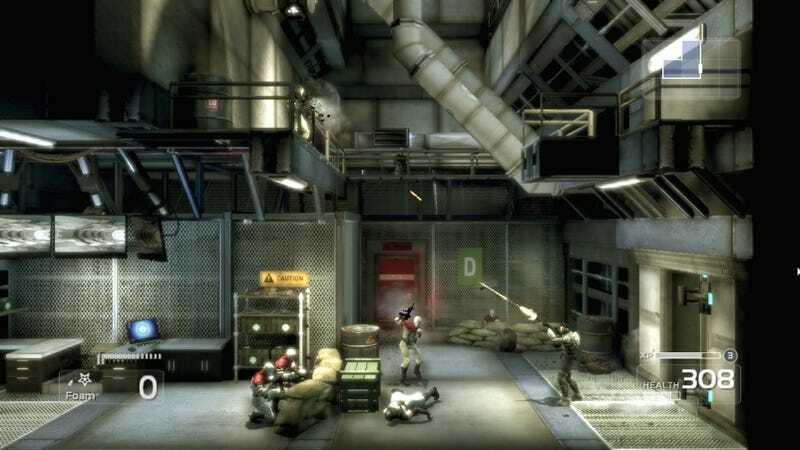 This is modern material: Shadow Complex is one of the rare 2D side-scrollers that takes advantage of being rendered in a 3D graphics engine. It's a The 3D-ness is shown off when Mustard has the game's hero Jason Fleming, man a turret and the sideways perspective switches to what could be a behind-the-back turret-shooting view from a Gears of War game. There's no parallax faking depth effects in these graphics. They're real 3D. When displayed in the manner of a 2D adventure, as they are in most of the game, the graphics have a depth not seen in this kind of game. The catwalks in the background. That guy shooting from back near the waterfall. They're back there and they can be shot, they can ragdoll over a balcony or fall into the front plane of action. Players will earn experience points for their hero in this game, leveling up some of his core abilities and granting, every 10 levels, a special power-up. More XP is earned for defeating enemies in creative ways. But Mustard said that players won't earn all their levels the first time through. The game's designed for an increasingly empowered playthrough each time players re-visit it. In addition, a Proving Grounds set of 21 unlocked challenges which present puzzles harder than many found in the main game are available from the start. Imagine having to grapple-hook and grenade-toss one's way around a hanging vertical wall suspended over a pit of fire. Or imagine a microcosm of a Metroidvania game with hidden power-ups that's just a few rooms large. Chair Entertainment, parent company Epic Games and publisher Microsoft have not announced a price yet for all this content. An announcement about the full Summer of Arcade is expected soon. And no, Mustard told Kotaku, he didn't show us everything. Like a good Metroidvania, there will hopefully be plenty more to Shadow Complex to make it worth our time to revisit later.